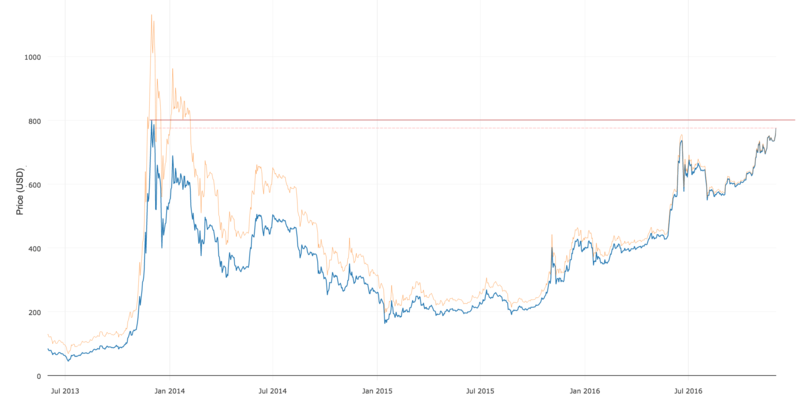 I thought it would be fun to plot this after reading Vinny Lingham’s post on deconstructing Bitcoin’s marketcap. Lingham reasons that since more coins are mined into existence daily, this has the effect of a continual stock split. All stock charts we see on Wall Street correct for this dilution effect so we can compare today’s price with past prices never mind the actual number of shares in existence. In this plot, we are assuming approximately 2.5m coins have been lost. In stocks this adjusted price graph would track your portfolio value accounting for extra shares issued to you, but in Bitcoin those extra issued coins go to the miners. Rather that modelling around stocks in a company, I see Bitcoin as a currency, so the FOREX rate to USD remains true at any point on the chart, never mind the M2 money supplies of each respective currency at that point in time. Perhaps for crypto-currency, it would be more correct to say M2 money supply rather than the word “marketcap”. Maybe others have thoughts on this?